I can hear the groans from some fight fans already, those who have suffered enough over the games both sides have played with regards to thus far putting the stumbling blocks on making the fight the whole world (still) wants to see: Floyd Mayweather-Manny Pacquiao. Roach went further in hyping the would be fight, stating how he believes his fighter will “overwhelm” Mayweather should the two superstars get it on. Of course, we’ve all been suckered in before, believing the fantastic showdown was just around the corner, only for the negotiations to break down on numerous occasions. It’s because of past disappointments that many fans will refuse to get their hopes up again, but the fight still makes sense on so many levels and who else is Mayweather going to fight next if he wants to earn the truly big pay-per-view bucks he and his paymasters crave? Pacquiao looked great on Saturday, arguably close to his dazzling best. 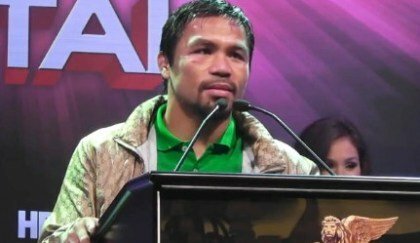 Certainly Pac-Man showed no signs of being gun-shy or rusty after the 11-month layoff that followed his crushing KO loss to Juan Manuel Marquez. Pacquiao looked super fast, he was accurate (albeit against a not too hard to hit target) and he had the old fire in his belly. I remain convinced that Mayweather sees something, and has always seen something in Pacquiao, that he doesn’t like – whether it’s his southpaw stance, his blurring hand speed, his withering power, or all three. Roach says his warrior would overwhelm Mayweather, and while I don’t go that far, it’s not all that hard to see Pacquiao outworking a pot-shotting, defensively minded Mayweather and winning a decision. Of course, Mayweather could position Pacquiao perfectly and land the perfect punch, ala Marquez. Or could Pacquiao beat Floyd to the punch and sensationally put his lights out? All three scenarios make the fight so fascinating – even today, at least three years on from when the fight should have happened. But again, is there any point getting all intrigued over this fight once again? Why should we believe the talks will prove successful this time around? Those fans who haven’t written off seeing a super-fight between a 35-year-old and a soon to be 37-year-old will be hoping Arum is correct and there is indeed a will and a way to make the fight.